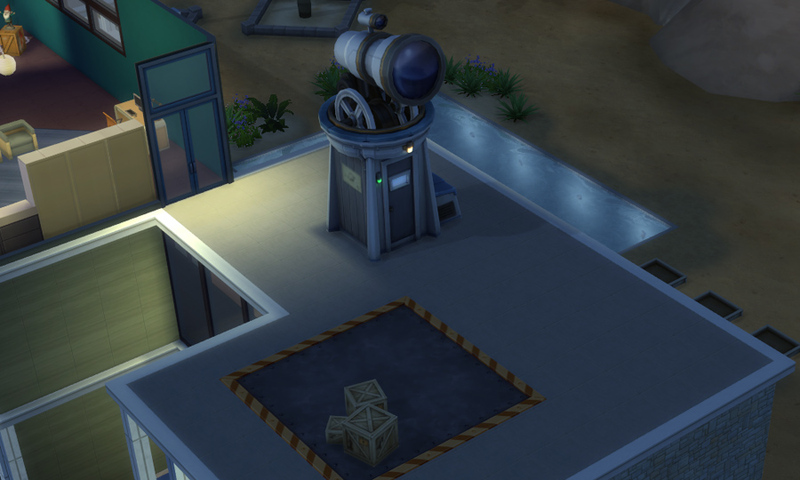 Observatory and rocket building space on the roof. 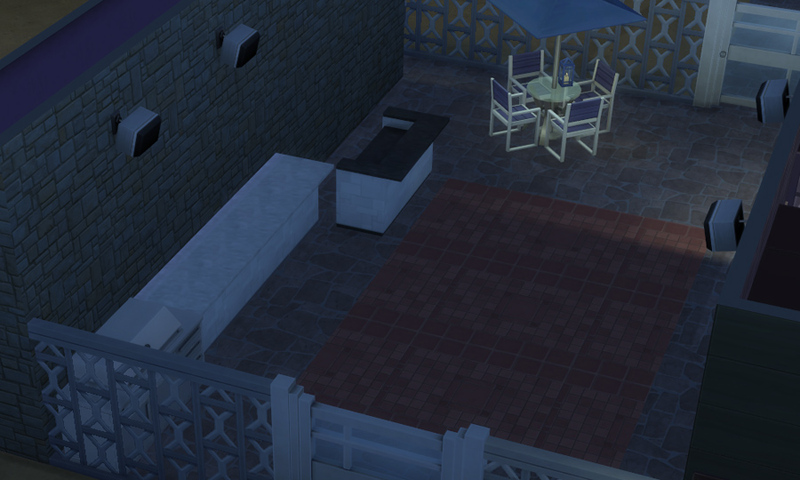 Revamped patio and new pool. 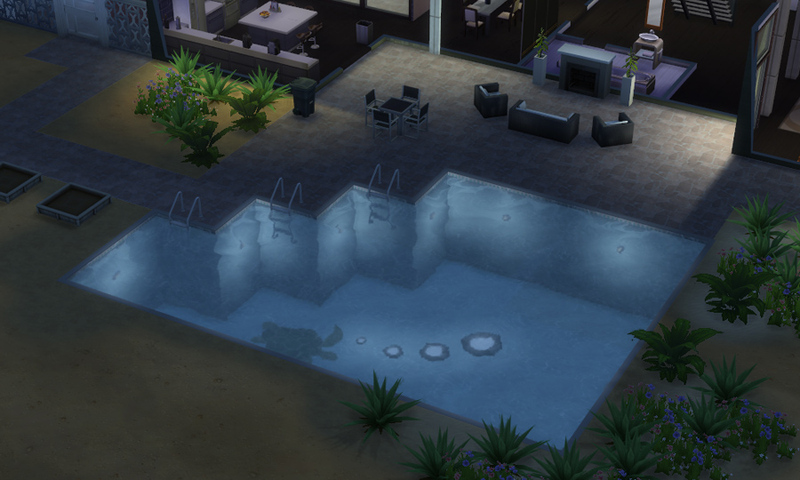 It’s impossible to imagine the super rich Landgraabs without a pool! 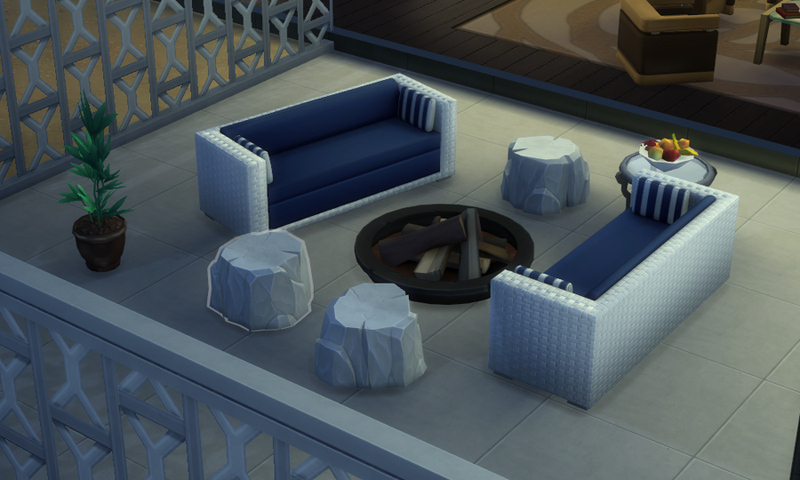 Outdoor buffet and party area. 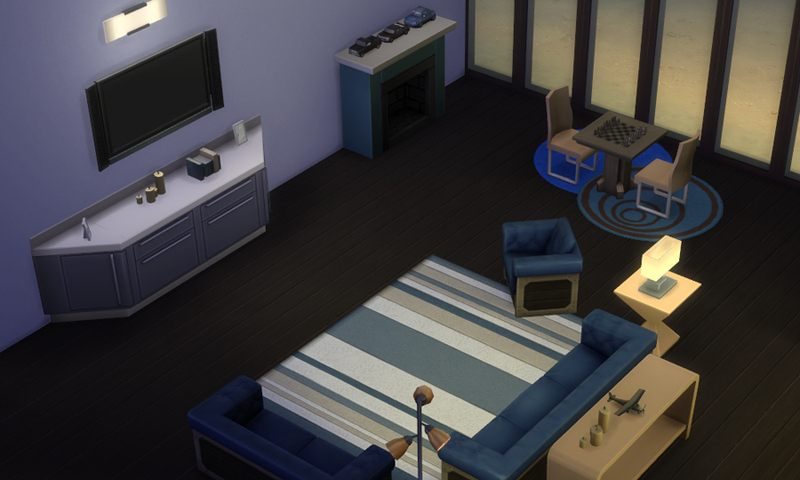 Blue living room. I like to think that Geoffrey collects model cars and airplanes. Writer’s nook. I just love writer’s nooks that are tucked under a staircase. Maybe Nancy can work here from now on. I especially like the red dress on her. Such business. Much wow. She chose the crimson combination as her everyday outfit. Nancy is currently in the criminal career! Oh no, that’s not what she told Sandra. I think she feels misunderstood and maybe is afraid to quit her criminal job? Well, too late, Nancy, now you have to take the plunge. I made her quit her old job and got her a job in the writer’s career. She might have to work herself up again but it will be for the best. She started off by reading a book but she just thought of how great of a movie this book might make. She should be writing movie scripts! Well you can soon do that, Nancy! I think she will be happy with her new job. When I checked on Malcolm he was peacefully doing his homework. I don’t trust him though… evil him might be planning something. 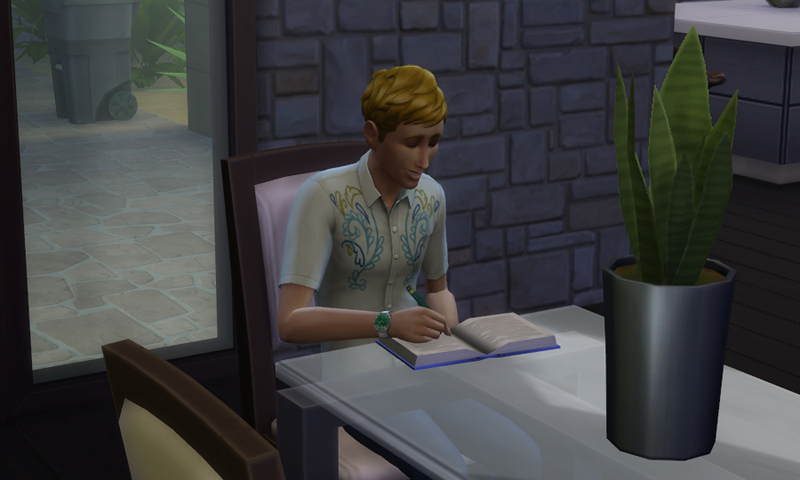 Maybe he’s not doing his homework after all but writing down plans for pranks? I’m watching you, Malcolm! Meanwhile, Geoffrey was practicing his charisma skill. Maybe he could re-charm his wife again? Things were getting stale lately. Not like this, Geoff, not like this. Geoffrey got pretty sad from not spending enough time with his family. 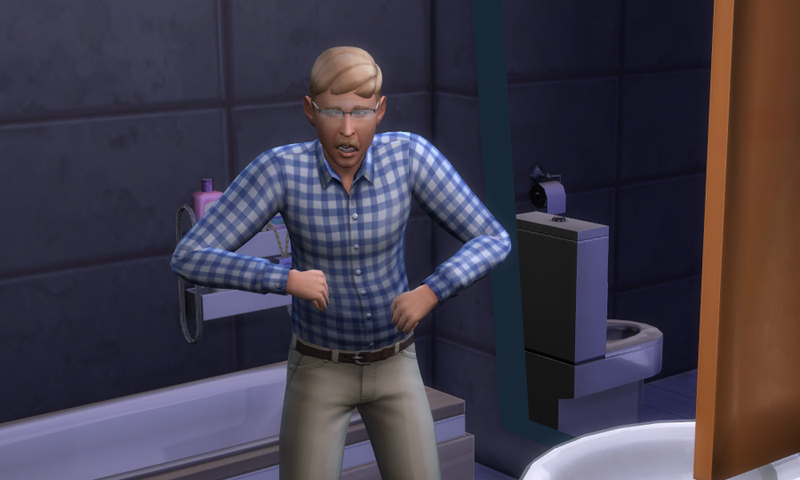 He’s a family oriented sim. I almost felt sad for him but then I checked his relationship panel. Gasp! 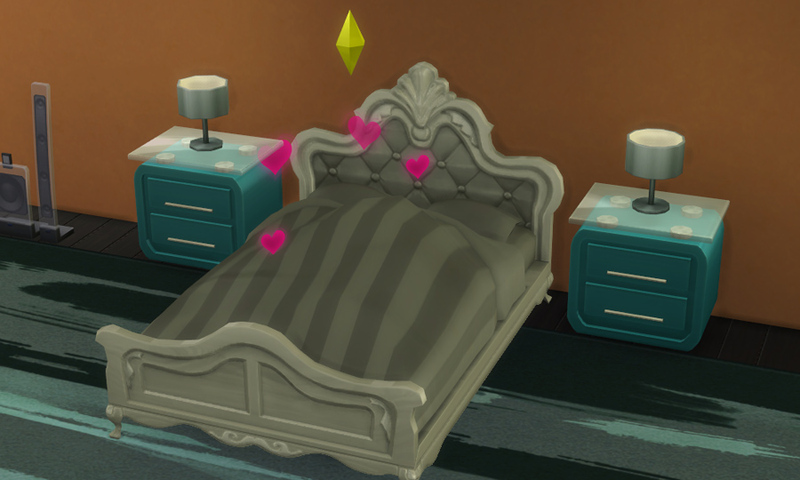 He’s having an affair! Nancy doesn’t have any other romantic interest by the way. Not a single one. This whole business made me think. I read up on the Landgraabs’ history and it says that Nancy was originally a Landgraab and had all the money. Geoffrey just married into the family. For some reason I always assumed that Nancy had married Geoffrey for the money but it was the other way around! (Maybe). Well, Geoffrey is not exactly a model so Nancy must have some genuine feelings for him. We just have to wake them again! And maybe I can get Geoffrey back on the right track. 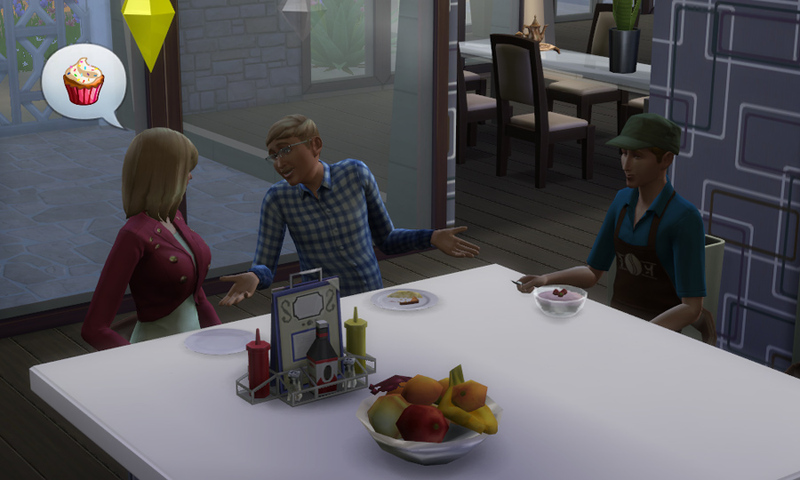 In the morning, the whole family actually gathered at the kitchen table (Malcolm had just come back from working at the cafeteria). I think that Geoffrey is really glad about Nancy’s new job (I assume he knows). He’s not really the type of guy who likes criminal activities. Maybe their marriage crumbled after he found out that she was a criminal? Well in that case, we can rekindle the romance now. “So, honey, uhm… what do you think about the new additions to the house?”, Geoffrey asked nervously. (Yeah, I admit, I told him to engage a conversation). Nancy might have been inclined to ignore him, but last chapter Sandra Muffin had given her some good advice – to feel more relaxed about things. So she light-heartedly answered. 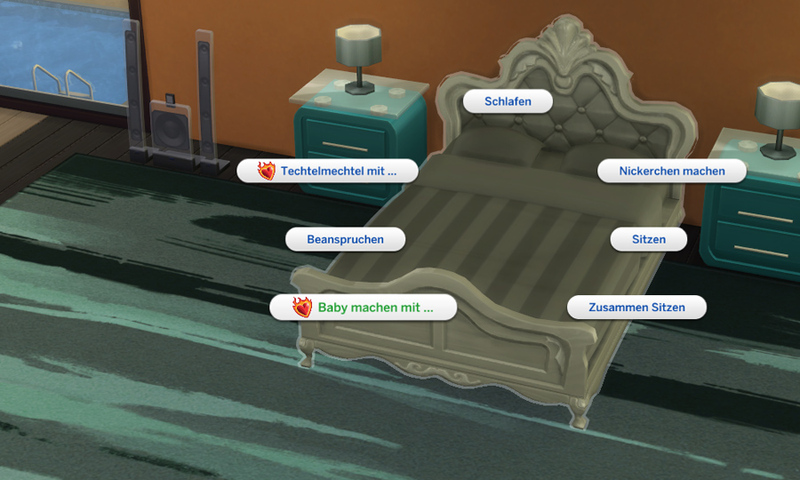 This is “Learning German with July and her sims”, live from the Landgraab household. So Nancy pulled Geoffrey into their bedroom and they tried for baby! By the way, while Malcolm was at school I received a question: Should he contribute to the group project or let the others do all the work? Since Malcolm is evil, I selected “Let others do all the work” (Die anderen die ganze Arbeit machen lassen). But karma comes around to bite you, Malcolm! He got a bad grade and came home exhausted and angry. Better work next time! That’s it for today! I hope you tune in next time to find out whether Nancy is pregnant! I forgot she was in the criminal career. She doesn’t seem the type to me at least. I listened to the wiki for the translation and it sounds like “tasty messy”. Bwahaha! He does sound like he’s waggling his eyebrows, though. Too funny! I hope their marriage continues to look up. Gregory needs to end his little side romance, though, before Nancy finds out. I’m unsure how she would react to that. 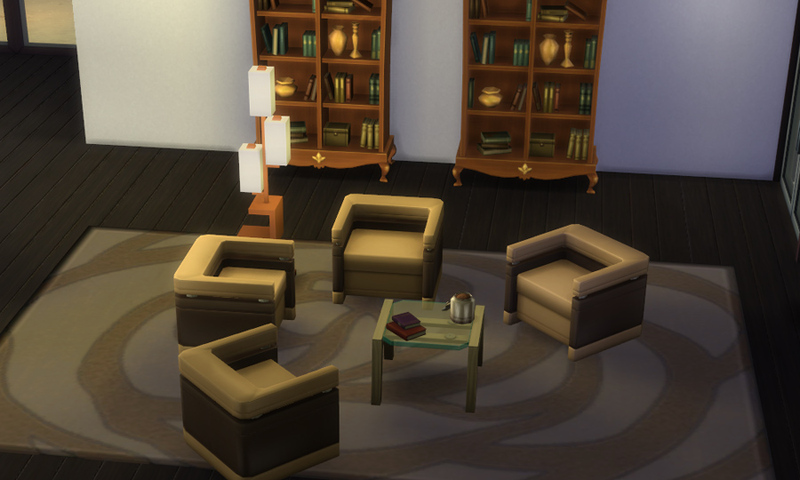 Love the makeover you gave the Landgraabs’ house and I wish Nancy best of luck in her new career. It’s a shame Geoffrey didn’t get along with 3 people and that he had an affair with another woman. I’m really enjoying your commentary and play style. I keep wanting to write a rotation story myself but never found my groove. Reading this makes me want to try again! Great intro to the Landgraabs and am glad you got Nancy to switch careers. Great decorating job on the house. Great intro to the Langraabs and shame on Jeffrey for cheating on his wife. Sorry that Malcolm had to learn a lesson the hard way at school. Hope to here little coos in the next chapter. I also like that “Try for Baby” looks like “Baby machine” to me. Thanks for the German lessons! I enjoyed your interpretations of this family. Funny! That pronunciation thing was hilarious. My husband laughed out loud. I nearly cried just now listening to the wiki guy read techtelmechtel. I absolutely imagined him waggling his brows. 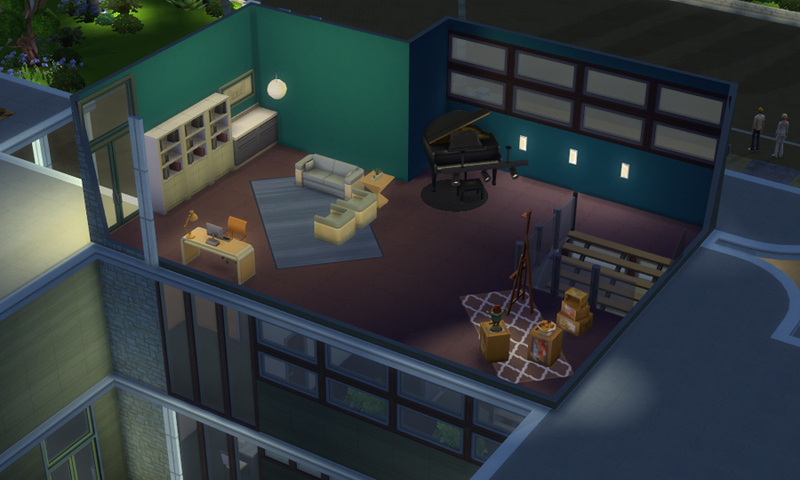 I’ve had the “switching syndrome” happen whenever I go into build mode–were you in build mode right before this? Really enjoyed your interpretation of the Landgraabs! Oh Geoffrey. What will he do with Maje? I hope things won't get too messy! Love what you did with the Landgraab’s home. I always felt it was so sparse (and no pool! c’mon!). It’s fun seeing another side to the Landgraab’s. Also “baby machen” — I read it like, “baby making” and it was so appropriate! Let’s get to some baby making! lol! On switching and standing on the sidewalks – If you close the game or go into manage households and then go back to the family you were just on, they are still doing all their same things. 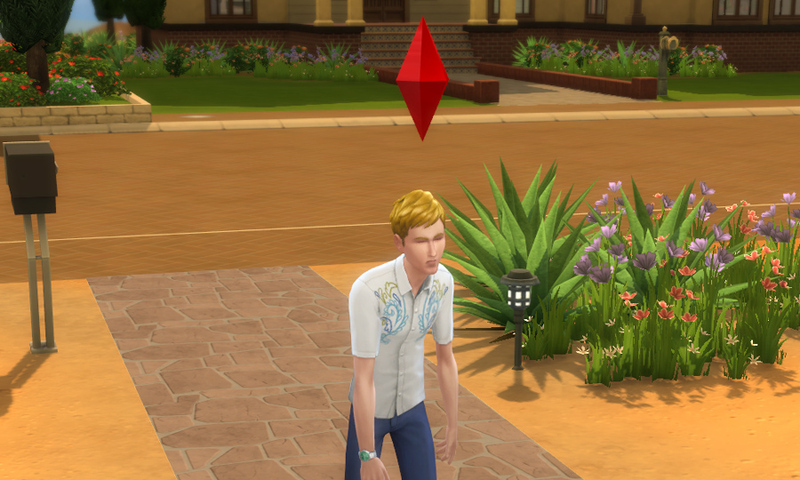 If you go into a new household (usually) they’ll be standing out on the sidewalk. I do like rachelrosebud and try to switch when I know that household should be at home. Techtelmechtel came up as “hanky-panky” for me. I like how Techtelmechtel rhymes, haha! I’m at work and can only make a quick comment, but about how Nancy and Geoffrey were out on the sidewalk when you loaded them up … I call this the “Switching Syndrome” (I’ll try to explain more on that Neighborhood Rotation thread you started on the forums) in that it’s unfortunately what I don’t really like about TS4 compared to TS2 (where everything is exactly as you left off when you last exited). 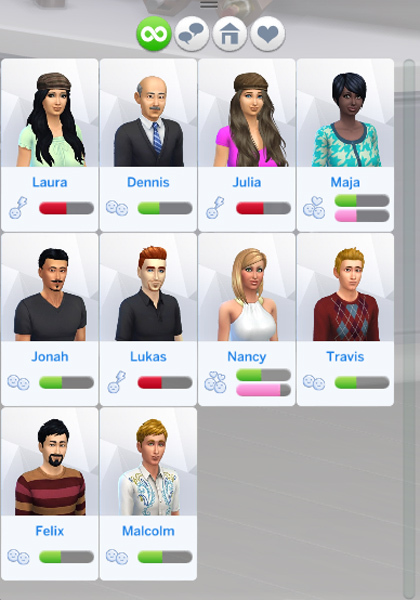 In TS4, I’ve had Sims lose their jobs (like Bob Pancakes) since they won’t be at work if you loaded them up during their work hours. 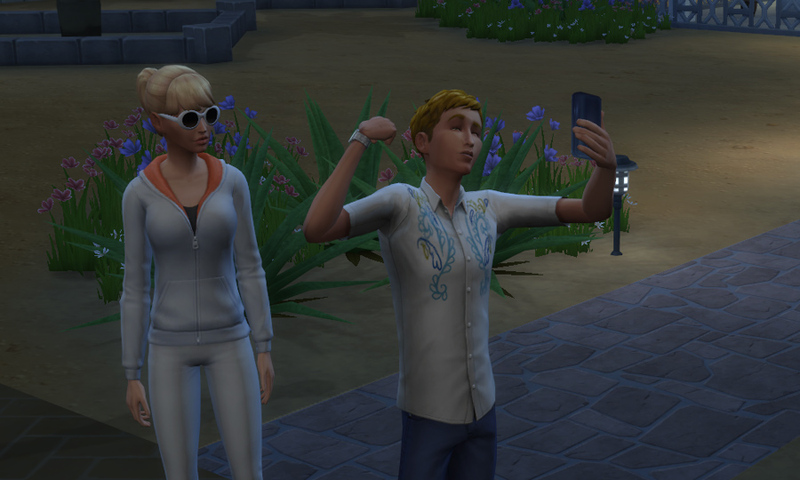 Ending play sessions between 4am and 5am in the morning is good since I don’t think a Sim’s work hours are ever during this stretch of time. 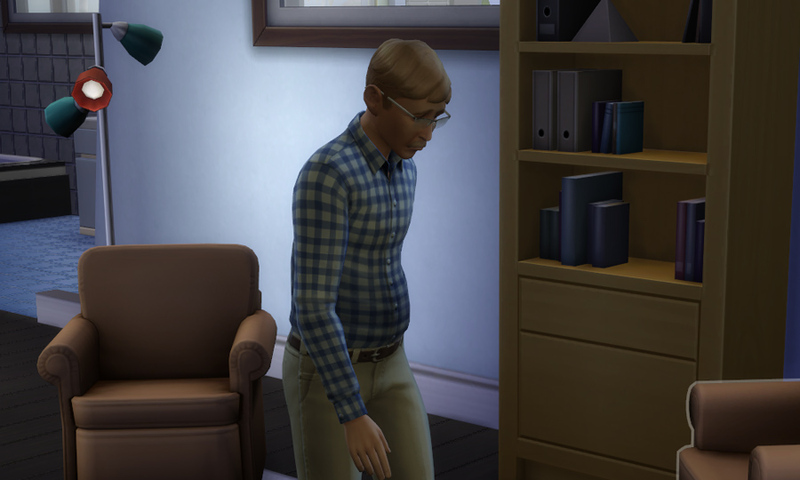 I miss some things about TS2 terribly 😦 But, I am super excited about TS4, more so reading your latest chapter. I LOVE LOVE how you pay attention to their thought bubbles and stuff. Gives them more life. I made Nancy quit her criminal career, too. She got into cooking big time and now runs a Bakery! Yeah the switching thing is annoying 😦 but it doesn’t always happen sometimes they are where I left them. 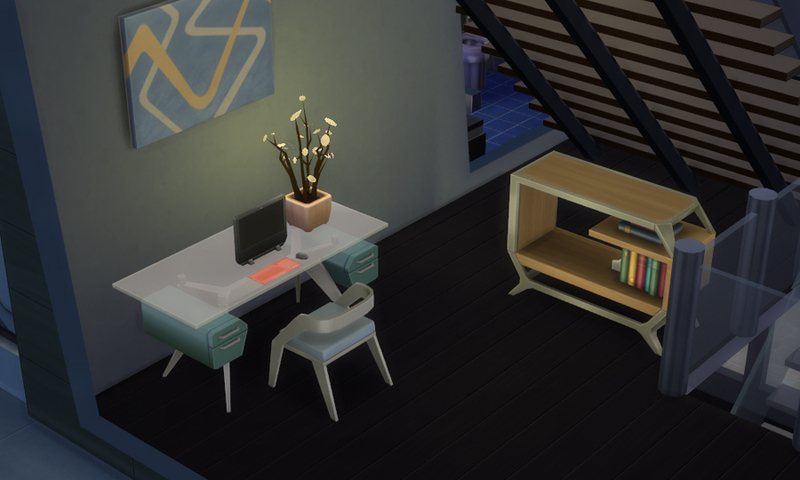 She wanted to be a writer so writer it is 😀 I will go through with malcolms aspiration though – I want to test out new Parts of the game after all.